Weight – 141.7g with 2 AA batteries for 25hrs use. Weight – 150g with 2 AA batteries for 18hrs use. To configure BaseCamp with summits download GPX file from ParksnPeaks then import. I have had issues in the past where a route defined at home is shown as a straight line in the bush. 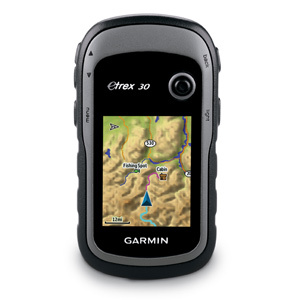 This is despite keeping the device FW current and using licences Garmin maps. To prevent this happening have decided to define proposed routes then convert to tracks for use. This device has a 2G SD card in it so storage not a issue. A ROUTE follows the network of the activated map. A TRACK defines your path. Read more about Tracks V Routes here. Tracks are recorded waypoints (coordinates) after a certain distance or time, usually distance. Depending on memory you can record an unlimited number of points. Tracks are not as efficient as routes for storage but they don’t require a map and roads to function. Routes can be as simple as a start and end point. BaseCamp and the GPS can use map information to calculate a route. When you convert a track to a route, BC inserts enough waypoints onto the track such that hopefully when the route is calculated through the inserted waypoints you get a route that follows the tracks. If there is no road or trail to follow on the map then you will get a straight line. Manually insert waypoints when no tracks are available.